Just back from Verden, with a bronze medal from the World Championships in the suitcase, Eye Catcher again performed really strong. Kirsten Brouwer rode the approved Vivaldi-son in the semi finals of the Pavo Cup competition to 94.5 points and to with this the lead. 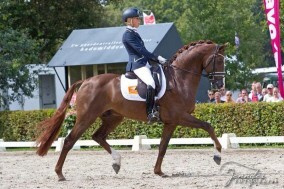 Estoril and Emmelie Scholtens became fourth with 88 points. Tomorrow both stallions will be in the finals for the 5-year-olds. Estoril and Emmelie Scholtens became fourth with 88 points. Five Star, the Amazing Star-son, will compete in the Finals of the Pavo Cup 4-year-olds tomorrow.